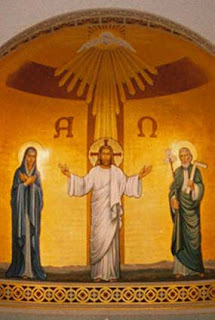 Trinity Sunday commemorates and honors not an event, but a reality: the Holy Trinity. Trinity Sunday falls on the Sunday after Pentecost. In 2011, Trinity Sunday falls on June 19. Trinity Sunday, officially "The Solemnity of the Most Holy Trinity," is one of the few feasts of the Christian Year that celebrates a reality and doctrine rather than an event or person. 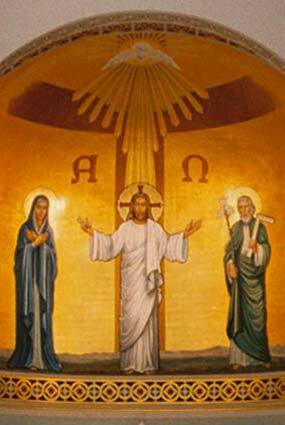 On Trinity Sunday we remember and honor the eternal God: the Father, the Son, and the Holy Spirit. Trinity Sunday is celebrated the Sunday after Pentecost, and lasts only one day, which is symbolic of the unity of the Trinity. The Eastern Churches have no tradition of Trinity Sunday, arguing that they celebrate the Trinity every Sunday. Westerners do as well, although they set aside a special feast day for the purpose. The Trinity is one of the most fascinating - and controversial - Christian dogmas. The Trinity is a mystery. By mystery the Church does not mean a riddle, but rather the Trinity is a reality above our human comprehension that we may begin to grasp, but ultimately must know through worship, symbol, and faith. It has been said that mystery is not a wall to run up against, but an ocean in which to swim. The common wisdom is that if you talk about the Trinity for longer than a few minutes you will slip into heresy because you are probing the depths of God too deeply. The Trinity is best described in the Niceno-Constantinopolitan Creed, commonly called the Nicene Creed. Essentially the Trinity is the belief that God is one in essence (Greek ousia), but distinct in person (Greek hypostasis). Don't let the word "person" fool you. The Greek word for person means "that which stands on its own," or "individual reality," and does not mean the persons of the Trinity are three human persons. Therefore we believe that the Father, the Son, and the Holy Spirit are somehow distinct from one another (not divided though), yet completely united in will and essence. How can this be? Well, think of the sight of two eyes. The eyes are distinct, yet one and undivided in their sight. Another illustration to explain the Trinity is the musical chord. Think of a C-chord. The C, E, and G notes are all distinct notes, but joined together as one chord the sound is richer and more dynamic than had the notes been played individually. The chords are all equally important in producing the rich sound, and the sound is lacking and thin if one of the notes is left out. The Nicene definition of the Trinity developed over time, based on Scripture and Tradition. The Scriptures call the Father, the Son, and the Holy Spirit "God," yet the three are also clearly distinct. For instance, St. John gives Jesus the titles theos and monogenes theos (God and Only-Begotten God) and has Jesus saying that the Father and Son are one, yet in his gospel Jesus also states that the Father and Son are not one witness, but two (John 1:1, 18; 8:17-18; 10:30). So John tells us that Jesus is God but not God the Father? Jesus is one with the Father, but they constitute two witnesses? It is scriptures such as these that led to the development of the Trinity doctrine. The Church had to reconcile the Divinity of Christ and the Holy Spirit with Jewish monotheism. Over time, and with the aid of the Holy Spirit, the Church reflected on the implications of God's nature, and even began using the word Trinity by the middle of the 2nd century to describe the relationship between the Father, Son, and Spirit. When in the 4th century a presbyter named Arius denied the Father and Son were both true God and co-eternal, his bishop Alexander of Alexandria challenged him and deposed him. Eventually the Arian controversy spread, and the emperor Constantine, newly fascinated with Christianity, convened a council of bishops in AD 325 in Nicaea to deal with Arianism. It is there that the Church drew up the beginnings of the current Nicene Creed. In the latter half of the 4th century the Church dealt with those who specifically denied the divinity of the Holy Spirit, adding more text to the creed. Ultimately, Trinitarianism posits a dynamic God, whose ultimate nature is beyond human conception, yet who voluntarily operates within the created world. Trinitarianism also shows a loving God that is willing to become as we are so that we may become like Him. The implications of believing in Arius' God, a God unwilling to involve himself in our redemption, but who instead sent an angel of the highest order, did not escape the earliest Christians. As St. Athanasius was fond of saying "that which has not been assumed has not been redeemed," meaning that unless God truly became completely human, we could not be fully redeemed, because only God Himself is capable of truly redeeming humanity; an angel does not have this ability. Thus, the Trinity is not about Greek philosophy or pointless metaphysical speculation, but about the heart of our salvation. For more information, please check out The Nicene Creed: Ancient Symbol of the Catholic Faith. The Church has been celebrating the Trinity in its life and worship since the earliest days of the Church, as evidenced by the Trinitarian baptismal formula. The earliest known liturgies (including that contained in the Apostolic Tradition of Hippolytus) include many references to the persons of the Trinity, including prayers that end with Trinitarian doxologies. Nonetheless, there was no general feast of the Trinity in the early Church. Over time, dioceses and churches began celebrating feasts of the Trinity locally, perhaps in response to Arianism. Early dates of the localized feasts include the first Sunday after Pentecost, or the first Sunday before Advent. Both placements have symbolic value. The post-Pentecost date celebrates the Trinity as the final celebration of the Church Year, after Christ's resurrection, ascension, and the descent of the Holy Spirit at Pentecost. The pre-Advent date, no longer observed, began the Church Year with the celebration of the Trinity, the source of all creation. Both show the importance of the Trinity as the foundation, beginning and end, of Christian belief and experience. Pope John XXII established the feast day for universal observance in the Western Church in AD 1334 on the present date. In addition to the yearly observance of Trinity Sunday, the Church's weekly, daily, and hourly worship is strongly Trinitarian in nature. Trinity Sunday has been especially popular in England, perhaps because Thomas Becket was consecrated on Trinity Sunday, AD 1162.